Sega’s Dreamcast is widely renowned by fans as the console in which the company seemed to pull out all the stops when it came to video game development. This creative openness led to some of the most original and quirky game ever released by Sega, and they gave the Dreamcast its own special identity. To this day, many of these games are still fondly regarded, and Sega has ported them to modern consoles and download services like the PlayStation Network and Xbox Live. One of the people involved in perhaps Sega’s most off-the-wall game was MariNaomi, an assistant localization producer at Sega of America. Working on Seaman, the creature evolution title that debuted the Dreamcast microphone, she wrote the game’s English dialogue and was integral in its localization for Western audiences. 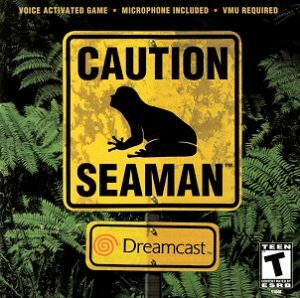 While it wasn’t a major seller in the U.S., Seaman was a prime example of how the Dreamcast pushed the boundaries of gaming, and MariNaomi labored intensely to maintain the charm that so distinguished it from typical game titles. Along with Seaman, she worked on some of the Dreamcast’s best titles, including Sonic Adventure, Space Channel 5, and Jet Grind Radio. Along with working at Sega, MariNaomi has been involved with game development at many other companies, such as Crystal Dynamics, Konami, Namco, Nintendo, and Activision. She is currently an indie cartoonist and has published five books. 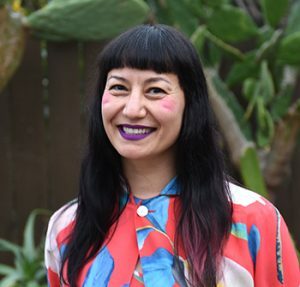 MariNaomi is also the founder of the Cartoonists of Color and Queer Cartoonists databases, as well as the co-host of a comedy advice podcast: AskBiGrlz.com. Ms. MariNaomi was kind enough to take some time to chat with us about her time working at Sega and on Seaman. Sega-16: How did you start at Sega? Sega-16: How did you become involved in a project like Seaman? It’s not a typical video game by any means. What was your initial reaction to it? 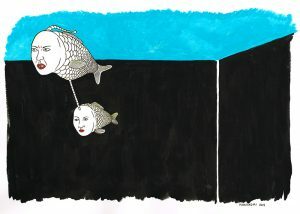 MariNaomi: I was already in Localization when I first became aware of Seaman (I don’t believe it was out yet in Japan, but I saw a demo, which was later shown at E3). I knew, the moment I first saw it, that I needed to work on that game. It was creepy and sarcastic, just like me! So, I went to my boss and begged him to place me on that game, should it ever come to the states. Sega-16: Was there every any initial reluctance at sega of America to localize it? Sega was a company that was creatively open, but Seaman was a lot… quirkier than most games. MariNaomi: Sega was taking a lot of risks back then, exploring new territory, which is why I pursued them as a company. I don’t know whether or not there was reluctance to publish it (I was a peon), but I do think management understood it had more chance to be a cult hit than a moneymaker. Sega-16: As Assistant Localization Producer, what was your role, exactly? MariNaomi: I did a lot of things in that role, most of it boring work I’ve blocked out. I was really there so I could write. For those who aren’t familiar with the process of localization, we basically took the Japanese games and made them into American games. There’s a lot of work involved in that, beyond the simple work of translation. Sega-16: How did you go about localizing such a Japanese title to the North American market? Were there any market-specific design changes that had to be made? MariNaomi: I can’t remember the exact logistics, but I do recall that Seaman was kind of a hit in Japan, and the creator, Yoot Saito, wanted to expand the game significantly. If I remember correctly (it was twenty years ago, so I may be wrong), the script expanded from about 200 pages to over 1000, with pretty much all new content. My main roles on that particular game were to write the dialogue and direct the voice actors. Sega-16: Besides the translation, what other things about Seaman had to be adapted for the Western market? MariNaoimi: The material was all new, so there wasn’t really any translation involved. I wasn’t involved in the back and forth so much, but I have a vague recollection that someone (sales? marketing?) wanted the game to be easier, and the creator insisted that it stay difficult and vague. Sega-16: How closely did you collaborate with Yoot Saito, the game’s creator? MariNaomi: I believe he approved the script before we started recording, but I’m not sure how involved he was. I don’t recall a lot of edits, and I only met with him a handful of times. My boss was his primary contact. Sega-16: What was it like to work with Leonard Nimoy? Did he ever mention his thoughts on the game? 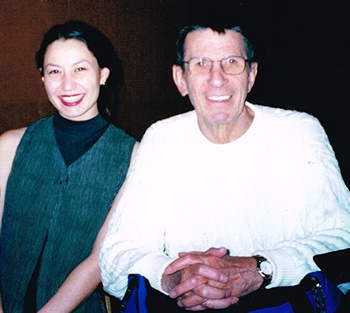 MariNaomi: I doubt Mr. Nimoy ever played the game. I don’t remember exactly what he said about the script, but I have a feeling he didn’t get it. I requested him as the narrator because of that old TV show he did about strange phenomena [Ed. Note: It was called In Search of…]. I’m still very proud of that pairing. It took him less than an hour to record his part of the script, and I was impressed with how professional he was. During the break, we made awkward small talk about his grandchildren. We didn’t have a whole lot in common, but he was pleasant enough to work with. I wish I’d known about his photography back then–we would’ve had a lot more to talk about! MariNaomi and Nimoy during the recording of Seaman’s dialogue. Sega-16: It’s remarkable that Nimoy came aboard the project. I can imagine the pitch Sega sent him! Did you have any other narrator candidates in mind? MariNaomi: The other person I had in mind was James Earl Jones, but Nimoy’s agent got back to me first. I do think Nimoy was the more appropriate choice, although it would’ve been very cool to work with Jones, as well. I think he would’ve scolded the player nicely. I don’t believe there was any pitch involved; We basically just hired him for an hour for his voice talent. It’s possible we sent him the script beforehand, but that’s it. Sega-16: You’ve mentioned that the game has a ton of Easter eggs, and one recently came to light about how it helped convince someone to not commit suicide. What prompted you to include that message in the game? MariNaomi: I rewrote that 1000+ page script in about a month on very little sleep, so it’s hard to say where my mind was exactly. I say “rewrote” because we originally hired a team of writers to write the game, but we ended up using very little of their work. Their work wasn’t dark or depressing enough for our tastes; it was more jokey. That’s also the reason I only had a month to do it all. Sega-16: How many Easter eggs do you estimate are in the game? Were they your idea, or were they already a part of the design? MariNaomi: The game, in my opinion, is one big Easter egg. There were central conversations we wanted Seaman to have with the player, but we were also trying to guess what kinds of topics might come up from the player’s side. We foresaw a lot of swearing, so there’s a giant swear bank included in the game. Seaman himself is not potty-mouthed, but we worried the swear bank would trigger a more mature rating if the person reviewing the script were to see the swears. Sega-16: You said that making Seaman was one of your “best/worst experiences.” Could you explain what you meant? MariNaomi: It was a lot of hard work for very little money. My team at Sega was the best group of collaborators I’ve ever encountered – I’ve never found that kind of camaraderie again. I was young enough to not understand what a blessing it was until after I was gone and saw how the real world is. I’m still parsing out this stuff, as I’m working on a graphic memoir about my time there. If you ask me this stuff in a year I might have a better answer for you. A painting of Seaman by MariNaomi. Sega-16: There has been talk of a sequel for several years. If and when it ever happens, what new features would you like to see? Our thanks to MariNaomi for taking the time to share her experiences working on one of our favorite Dreamcast titles! For information about her, head over to her website.